What you can learn from a landscape company that survived the year both of its owners were deployed. Larkin Scott III recalls having this thought in the summer of 2015 when he found out that he’d be deployed for the third time in his role as a Black Hawk pilot with the Virginia National Guard. His worries were those of any soldier being deployed to a place like Iraq. After all, he would be away from his family for a year and even miss the birth of his second child. But his concerns carried an additional weight. He knew his brother and business partner, Luke Scott, a fellow member of the National Guard, also would be deployed at the same time, albeit with a different unit. 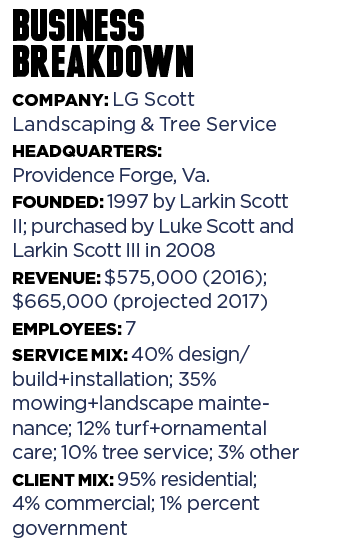 The pair co-own LG Scott Landscaping & Tree Service in Providence Forge, Va. They bought the company from their father, Larkin Scott II, in 2008. 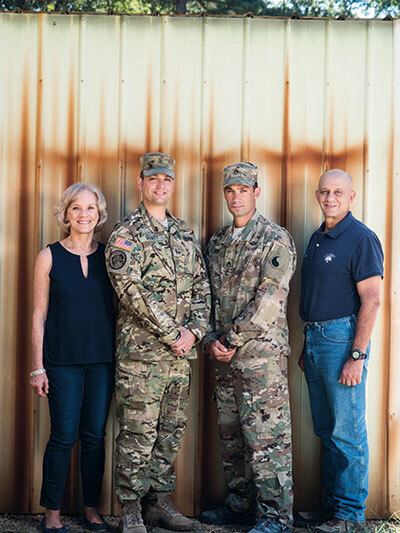 Members of the Reserves and National Guard can be called up at any time, so the family always knew this situation was a possibility, but they still didn’t expect it. “For a while, Luke was in a unit that didn’t need to deploy, and I had already done two deployments, so it didn’t seem like it would ever happen,” Larkin Scott III says. But it did. They could have requested not to deploy, but they thought it might hurt their Guard careers. Besides, they joined the service knowing they may have to serve overseas. “We wanted to do our duty, so we said, ‘Let’s figure this out,’” says Larkin Scott III. Luke Scott, who serves as an infantry scout squad leader, deployed in May 2016 to Qatar, and Larkin Scott III departed a month later to Iraq. They left the business in the hands of their mom, Dale Scott, who had served as office manager since the company was founded in 1997. They also promoted a key employee to general manager. They created a comprehensive operations manual and spent a few months working on a plan for the business to run while they were gone. Before they left, the brothers thought they were well prepared, but they learned they could have done a better job setting up the company for success during their time away. The company survived, but profitability faltered. They returned earlier this year—happy to be home safely, grateful for their family’s help and motivated to build and grow a profitable business that’s less reliant on its owners. When it comes to family support, Luke and Larkin Scott III recognize how lucky they are. Their father, Larkin Scott II, who sold them the company and retired in 2008, stepped in. Their younger brother, Levi, who has a career in a different field, also helped as needed with equipment repair and other duties. Their mom and office manager, Dale Scott, shouldered much of the burden while they were gone—especially when the general manager they had promoted started dropping the ball on duties like overseeing the shop and equipment maintenance. When he quit in January, several months before either owner was slated to return from overseas, Luke Scott got released early to come home to keep the business going. The family also got support during the deployment from the members of their Leader’s Edge Peer Group, operated by consultant Jeffrey Scott. Despite all the support, having both owners gone for the better part of a year created some people problems in the company. With the owners gone, the company’s lack of systems and accountability came to light, Dale Scott says. For example, employees always had been trained in an “apprenticeship-type” program on the job by an owner—Luke Scott on the installation side and Larkin Scott III on the maintenance side. They assumed their general manager would take over those duties while they were away, but it didn’t happen, so new employees didn’t have training to fall back on. The lack of an onboarding system created problems for current employees, too. “We wound up with a lot of turnover and turmoil for our employees that stayed with us the whole time we were gone,” Larkin Scott III says. Since returning from deployment, the owners quickly implemented a formal training program, using manuals from the National Association of Landscape Professionals. The company also created a program for internal certifications and testing. To increase accountability, which was another problem that arose when the owners were away, they have implemented a five-point incentive program that assesses employees based on the company’s core values: excellence, loyalty, integrity, teamwork and efficiency. These items used to be “just a sign on the wall,” but now employees are evaluated and given feedback on them weekly. Crew leaders and crew members can earn an extra $4,500 and $3,500 per year, respectively, by meeting key performance indicators associated with the core values. “We’ve incentivized good behavior, like showing up on time, being honest and coming in on budgeted hours,” Luke Scott says. They’ve also tried to build their company with a military team mentality. It’s nothing formal or fancy, Luke Scott says, but he’s tried to instill in the core staff that it’s their job to give feedback on one another—not to “tattle,” but to ensure they have a strong team. Since the brothers returned from their deployments, the company is “systemizing” other areas of the business, as well. It’s all an effort to improve profitability and reliance on the owners. They’ve identified—and are working to fix—a few areas where they were “sloppy” or are underutilizing people and resources. While they were gone, communication was inconsistent. Larkin Scott III was hard to reach and often didn’t have internet. Luke Scott had access to a phone and internet connectivity, and he spoke with his mom and the general manager a few times a week. Dale Scott also sent her sons a weekly report including cash flow and any major issues. In hindsight, Luke Scott says he would have wanted more details. Today, reporting and monitoring information has become a priority for the company. During the owners’ time away, there seemed to be a lot of lost time, Luke Scott says. The company has used Service AutoPilot as its primary software for several years, but it realized it wasn’t vigilant about entering data properly. Now, the company has a weekly meeting where it focuses on safety and the importance of recording information accurately in the software system. Each crew has a cellular-enabled tablet and clocks in and out of tasks via the software’s app. Having good data leads to better job costing and, ultimately, profitability. “If you work hard all month and then you see you didn’t have much of a profit, it gets you motivated about recording information,” Luke Scott says. The company also has learned to better leverage GPS fleet tracking, which it added through a service called InTouch. At $25 per month per vehicle, it’s a quick return on investment, Luke Scott says. Adding GPS has eliminated speeders, idling and lost time due to stops at convenience stores. If a truck enters a convenience store, the owners get an alert. The owners also are working to streamline their duties and communication to be more efficient. One area they immediately addressed was clearly defining roles for all employees, including Dale, Luke and Larkin III. They’re also better at using a component of their software system that allows them to assign one another “to-do’s” and lets others see and comment on these items. All three of the company’s managers acknowledge it wasn’t an easy year for their family or their business. Dale Scott, in particular, is happy to have her sons home. 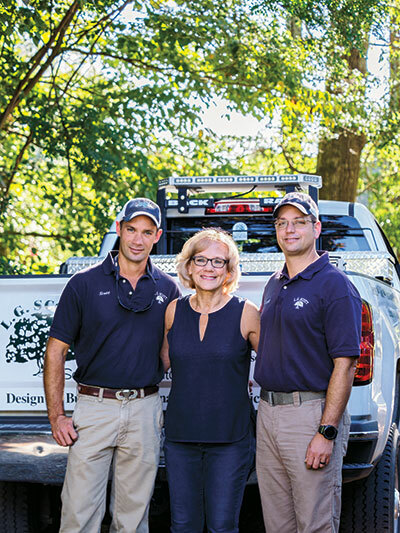 Returning from deployment to learn their business needed some work was daunting, says Larkin Scott III, owner of LG Scott Landscaping & Tree Service. He took solace in the advice of consultant Jeffrey Scott (no relation), who runs the Leader’s Edge Peer Group to which the company belongs. The company survived the deployment, but profitability slipped, which was discouraging to the owners.